Most people know how to take good care of their teeth, but completely forget their gums. At Haddonfield Dental, we help patients look after their entire smile, including their gums. Our dedicated dental team is proud to help Cherry Hill residents enjoy healthy smiles with quality periodontics. If your gums need some TLC, make an appointment with our office today! What Makes Gum Disease Serious? The gums may be a small part of your mouth, but when something goes wrong, the consequences are severe. Gum disease is the number one cause of tooth loss. In fact, in elderly patients, it isn’t aging that causes tooth loss – rather, the effects of aging increases your risk factor for gum disease, which is what typically leads to tooth loss in the elderly. Not only does gum disease lead to poor oral health, but a gum infection can spread to other parts of the body, creating secondary infections in other parts of the body. These infections can even occur in the heart or brain, and in rare cases, can be fatal. Advanced gum disease is easier to detect, but much more difficult to treat. In the later stage, periodontitis, the gums begin pulling away from the tooth root, creating empty pockets below the gum line. These pockets often become infected, increasing the risk of cavities and spreading infection. You might assume that good brushing and flossing is enough to prevent gum disease. However, several factors can lead to gum disease, and it’s important to be aware of all of them to keep your gums healthy. Elderly patients are at a greater risk of gum disease because of the many risk factors they're exposed to. Some medications have side effects that can make gum disease more likely. Blood pressure medication, for example, can cause dry mouth, which raises gum disease risk. Years of tobacco use also takes its toll, and tooth loss due to tobacco-related gum disease or tooth decay is common. Mental and physical decline also makes it more difficult to perform simple tasks, including oral hygiene. It’s important for elderly patients to continue to see the dentist regularly, especially if they show signs of gum disease. Contact our office to make an appointment for yourself or your loved ones. One of the more unexpected effects of pregnancy is an increased risk of gum disease. Hormone changes make it easier for certain bacteria to grow, and increased blood flow can make the spread of infection easier. Unfortunately, gum disease can be even more dangerous during pregnancy. Studies have shown that there may be a link between gum disease and premature birth, as well as low birth weight in newborns. It’s essential for expectant moms to practice good oral hygiene at home, and make sure to have a checkup during their pregnancy to guard against gum disease. Periodontics is the treatment of the gums. The dentist chooses the appropriate treatment for you based on your symptoms and how advanced the gum disease has become. With gingivitis, good dental care may be able to reverse the symptoms and restore the gums to health. A thorough exam can spot problem areas to target, and a cleaning removes the plaque and tartar irritating the gums and causing inflammation. The dentist will also provide tips and education on how to keep your gums healthy at home. 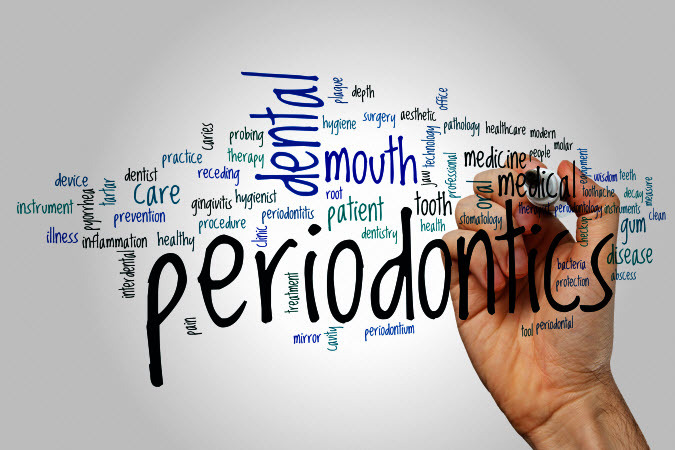 If the gum disease has advanced to periodontitis, more specific treatment may be needed. A deep cleaning, also known as scaling and root planing, is the standard method for removing harmful substances below the gum line. As the gums pull away from the root, they form empty pockets beneath the gums. These pockets then become filled with plaque, tartar, and bacteria. Treating these pockets starts with an antibiotic rinse or gel to clean out any bacteria. The plaque and tartar are then scraped off the tooth root (scaling), and finally, special tools help smooth out the root surface (root planing) so that the gums can reattach easily to the tooth. Sometimes called osseous surgery, this treatment is used to reduce large pockets within the gums. This helps to stabilize teeth and reduce tooth loss. If the gums have seriously receded, they won’t grow back to where they were before. To restore the gum line, a piece of gum tissue is grafted into place, thus protecting your teeth and approving the appearance of your smile. 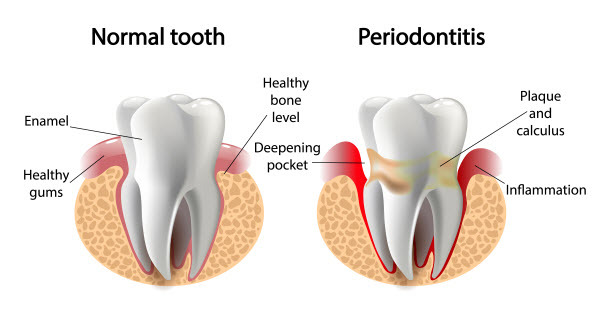 Once you’ve had periodontitis, your gums are much more likely to develop severe symptoms again. To ensure that your gums heal well and stay healthier, the dentist will likely insist on frequent maintenance checkups, usually every three months. During these visits, the dentist measures the depth of the pockets under the gums and performs a cleaning to help the healing process. A thorough exam also helps to catch any problem areas where gum disease may develop. Want a Healthier Smile at Home? Remember These 7 Steps! Getting your gums back to health is a long process that can’t happen without you! With the right gum-healthy choices, you can get your smile back in shape that much faster. Just follow these seven steps! Brush twice a day, especially before bed. Floss once a day between every tooth. Trade sugary foods for vitamin-rich fruits and veggies. Avoid smoking or using tobacco products. At Haddonfield Dental, we believe in working with patients to create their best chance of healthy smiles. We do all we can to help your smile during your visits and provide the tips and tools you need to do your part at home. Let us help you work toward a better smile. Schedule a visit to our Cherry Hill office today!